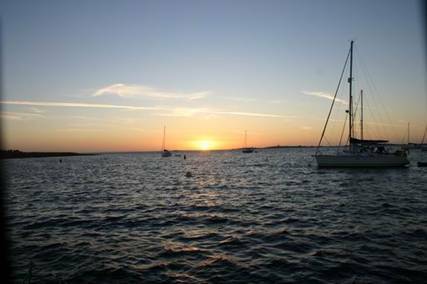 We woke up to see a beautiful sun rise over the Islands, which marked the start of another very sunny day. 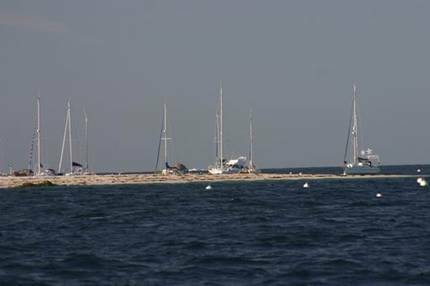 We left our visitors mooring at 0900h and had a wonderful sail in 14kts of NE breeze The wind held until 1400h, when it then dropped to 4kts and went to the east. 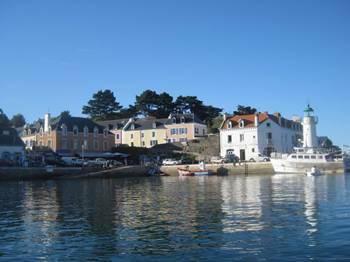 So on went the engine again and we headed for Sauzon on Belle Ile. 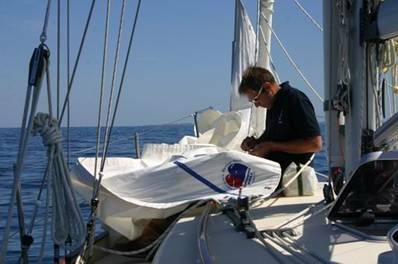 The spell of motoring gave Alan a chance for his first sail repair. The leech line on the foot of the genoa had come unstitched (we think this was due to the sheets rubbing on it when furled in Camaret when the sheets hadn’t been tightened properly). 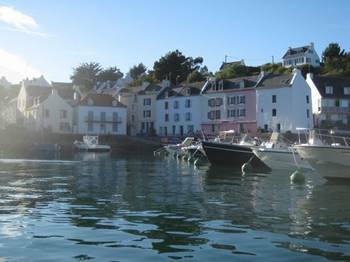 Late in the evening a 20kt easterly wind developed which blew straight into the little harbour and caused all the boats to pitch around wildly. It was so choppy that we were pitching enough for the bow roller to be dipping into the water and we chaffed through one of the three mooring lines we had attaching us to the front buoy. It was too bumpy to sleep in the forepeak, so we had to sleep in the main saloon, although neither of us got much sleep! The previous time we were in Sauzon we had a similar choppy night, although nothing like as bad as last night. 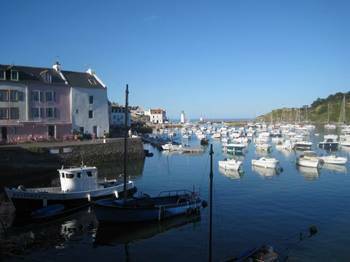 We probably should have realised that the easterly wind would have made the visitors moorings untenable for the night, but the attraction of the beautiful little harbour was too much!